Featuring 100% transfer efficiency, Rollmaster 5000(TM) does not create any over spray, enabling use within 3 in. of obstacles. Integral peristaltic pump, driven by battery-powered, 12 V gear motor, squeezes paint through delivery hose so that paint does not come into contact with any pump component. This, along with disposable paint roller and hose, results in cleanup times of less than 5 min. Noiseless unit does not generate gas or exhaust fumes and comes with on-board charger. 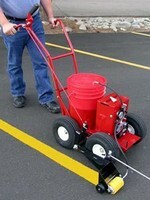 Newstripe, Inc. announces the introduction of the Rollmaster 5000 paint striper. According to Ralph Newman, president of Newstripe, Inc, it is the only striper priced at under $1,300.00 that can pump paint directly from a five gallon pail. Plus, it is so simple to use anyone can stripe perfect lines the first time out. The Rollmaster 5000's unique peristaltic pump "squeezes" the paint through the delivery hose, so no paint contacts any pump component. This coupled with the disposable paint roller and hose makes clean up quick, usually taking less than five minutes. A battery powered 12-volt gear motor drives the pump. One charge from the on-board charger will give over 24 hours of continuous striping. "The Rollmaster 5000 beats expensive spray type machine hands down", says Newman. "It has 100% transfer efficiency so all the paint stays on the surface. This can save up to 20% in material costs. Plus the Rollmaster 5000 gives you the best edge quality available. It does not create any over spray so you can stripe within three inches of cars or other obstacles". The environmentally friendly Rollmaster 5000 is quiet and does not generate gas or exhaust fumes. Being noiseless makes it the perfect choice for night jobs or quiet areas such as hospitals. Warehouse and manufacturing managers will find the fumeless Rollmaster 5000 perfect for keeping their aisles and danger zones clearly and safely marked. Additionally, the Rollmaster 5000 is the ideal replacement for aerosol type stripers. Using bulk paint can save up to 75% of the cost to stripe parking lots, warehouses and factory floors. Plus, the troublesome and expensive disposal of hazardous aerosol cans is eliminated.